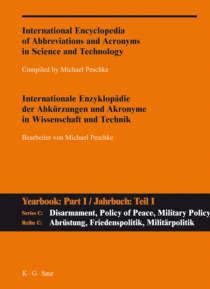 The International Encyclopedia of Abbreviations and Acronyms in Science and Technology together with the complementary Yearbooks from 2000 to 2006 now comprise over 1 million entries. The comprehensive register contains acronyms from the most variegated subject domains and areas of life. It not only contains official current abbreviations, but also takes account of forms used in everyday langua… ge and obsolete forms. Each of the volumes contained in Series C contains approx. 65,000 entries on policy and research from the fields of military, peace and security policy.